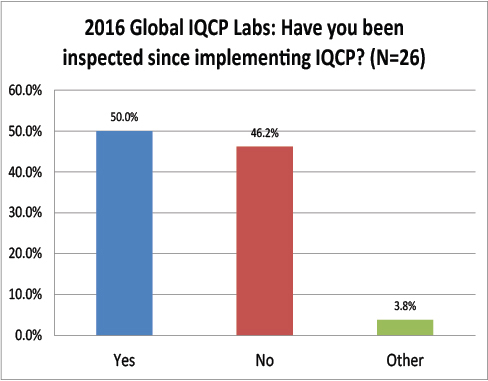 Here are the global results of our 2016 Survey of IQCP Users. Over 210 results from both within the US and abroad were received, but the global results are significantly different than the responses from within the US! Over 50 laboratory professionals from around the world shared their experiences with us about their implementation of IQCP. These labs adopted IQCP because they wanted to, not because they were forced to by US regulations. Even if many of these labs were CAP-accredited, outside the US IQCP is truly a voluntary activity. As with the US respondents, we had a vast majority of core laboratory users reply to our survey, and very few small laboratories. The most common respondents came from large labs (between 1 and 10k test per day), but there were also some smaller labs (200 to 500 tests per day). 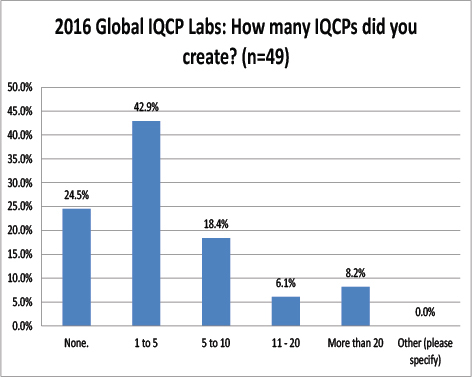 Global Labs: How many IQCPs have they completed? Very similar to the US, most labs report having only completed a few IQCPs, between one and five. Very few of these labs had completed a large number of IQCPs. 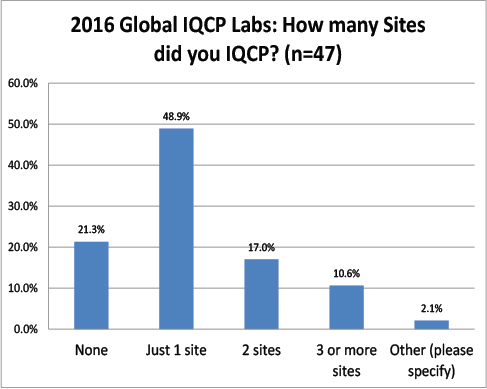 Global Labs: How many sites needed IQCPs? Almost a majority of the respondents only planned IQCPs for a single facility. Unlike the US, very few had to plan for more than one site. Unlike the US efforts, most of the respondent labs had just a single person develop their IQCPs. The second-most common answer was 3 people. 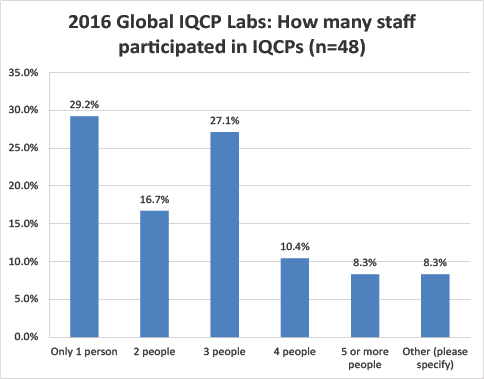 A quarter of the US labs needed 5 or more people to develop IQCP, while less than 10% of the global labs devoted 5 or more staff to the IQCP development process. The most common response from global labs was that they relied on manufacturer-supplied IQCP materials. While this might not be allowed in the US, it may be fine abroad. The next most common response was that it took less than 1 hour. It seems that IQCP development takes less time outside the US than inside. Global Labs: What Resources did they use to develop their IQCPs? 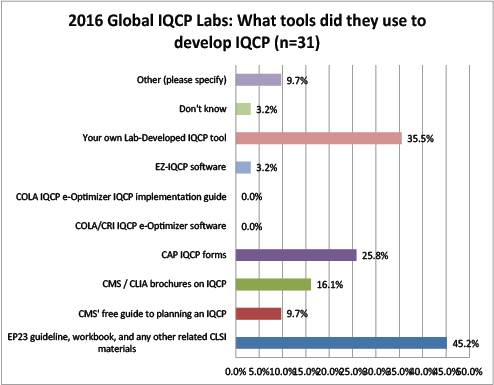 Most global labs used EP23 or their own tools to develop IQCPs. Unlike the US labs, the global labs didn't make much use of the CMS brochures, forms, and/or guide. Even fewer labs are using any software or tools from COLA. 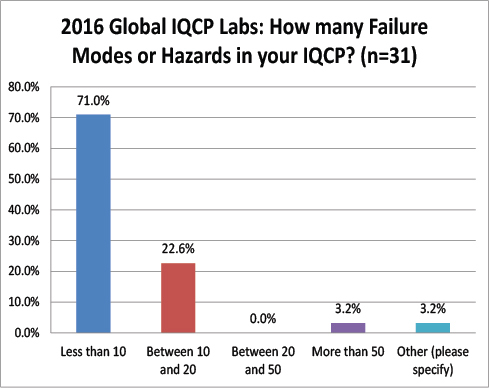 Where US labs found between 10 and 50 failure modes in their IQCPs, the vast majority of global labs found less than 10 failure modes. Strange that there is such a difference in IQCP development. Perhaps the global labs are choosing less risky tests for their IQCPs? Or perhaps there is a real chance that risk assessment is not reproducible? 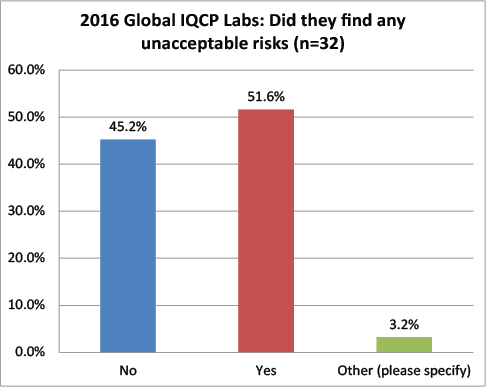 Global Labs: Has the IQCP process revealed any unacceptable risks? While more than 68% of the US labs found no unacceptable risks, more than 51% of global labs found unacceptable risks. A definite divergence of IQCP findings. Global Labs: Were any New Control Mechanisms Required? While only 17% US labs found a need for new control mechanisms, 44% of global labs did. Again a serious discrepancy between the two groups. 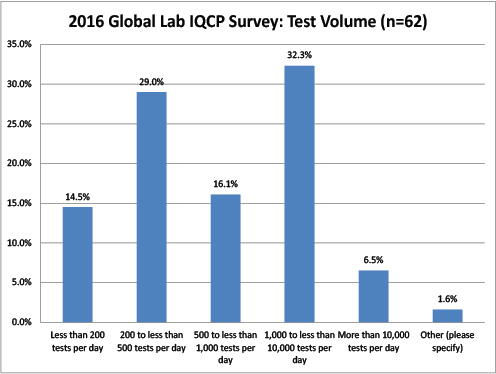 Global Labs: After IQCP, how often are they performing their QC? 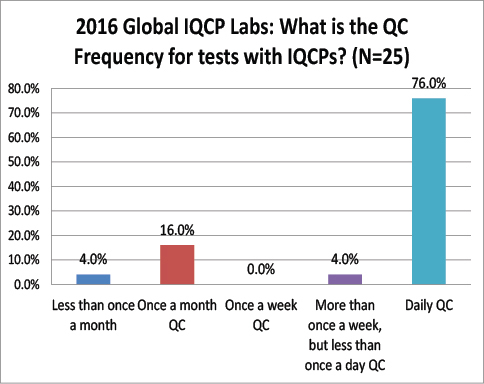 Again a striking difference here: The vast majority of global labs do not change from daily QC after finishing IQCP, where are over 68% of US labs have switched to once a month QC. 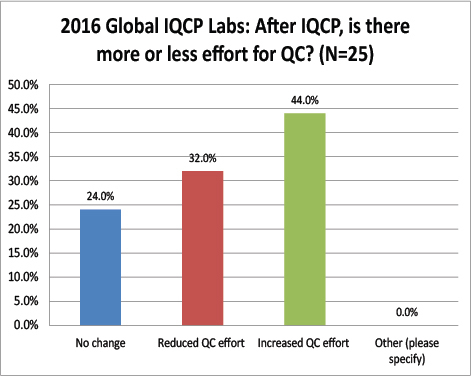 Very few global labs have actually reduced their QC frequency as a result of IQCP. 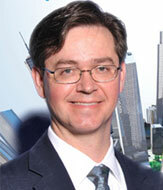 Does this mean that there are fewer risks here in the US than there are abroad? Are tests more risky outside the US, requiring more frequency QC? Global Labs: Have their IQCPs been inspected yet? Still another paradox: while only about 31% of the US respondents had been inspected, half of the global respondents had been inspected. Is it possible more global labs are getting their IQCPs and labs inspected than those within the US? 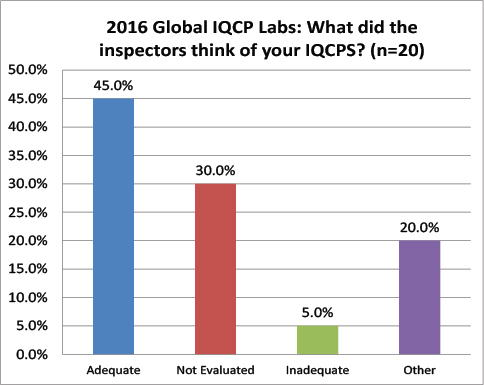 Global Labs: Did your IQCPs survive the Inspection? Finally a little more convergence. 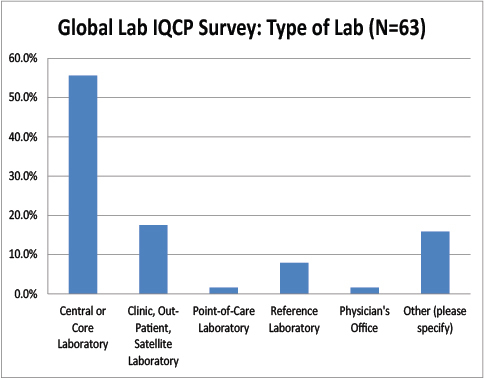 45% of the global lab IQCPs were deemed acceptable, compared to 59% of the US lab IQCPs. 30% of global IQCPs were not evaluated, compared to 34% of the US lab IQCPs. 5% of the global IQCPs were deemed unacceptable, compared to 5.8 of US IQCPs. 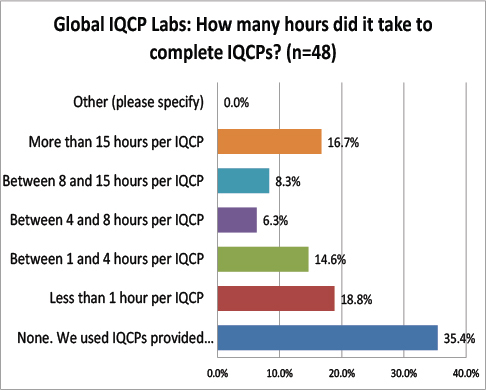 Global Labs: What is your overall satisfaction with the IQCP process? 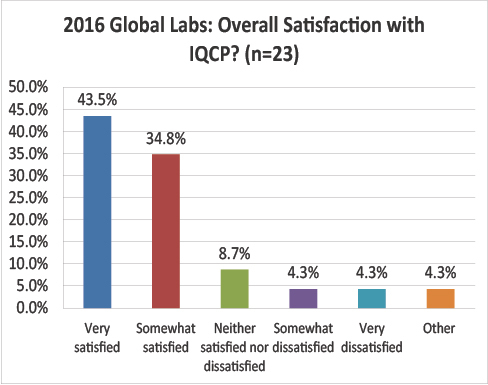 A final conundrum: global labs are much happier with the IQCP process than US labs. 45% of global respondents are very satisfied, while only 6.5% of US labs are. Nearly 80% of global respondents are satisified or very satisfied, compared with less than 30% of US respondents. Download the chart-pack of the global survey results. Go back to the views of US labs.